Living with less truly is so much more for you. And we take care of all the bulky details—the bed, the sofa, the kitchen table and chairs, the washer and dryer, everything. We’re quite the pair. In fact, our furnished Springfield apartments include everything you need and then some. Take advantage of our mixed-use community in Galloway Neighborhood: we’ve got shopping, yoga and dining just an elevator ride from your front door. Plus, there’s the Greenway Trails, breweries and other community amenities within biking distance. 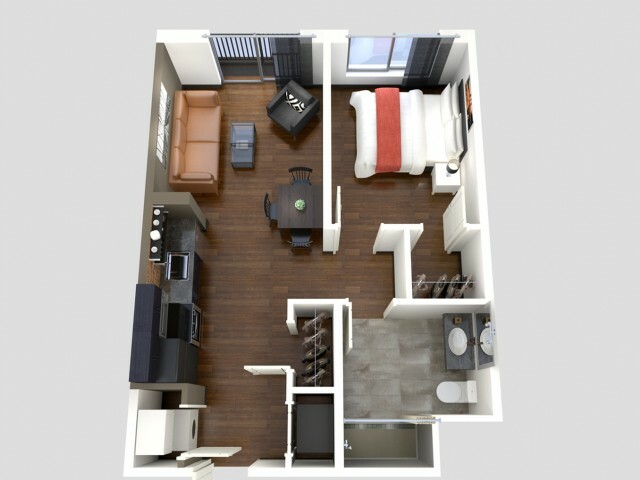 We’ve got the one bedroom floor plan you see above, and an even cozier furnished studio option. Already have your own furniture? Check out our unfurnished one-bedroom lofts for rent!